Hello, all! 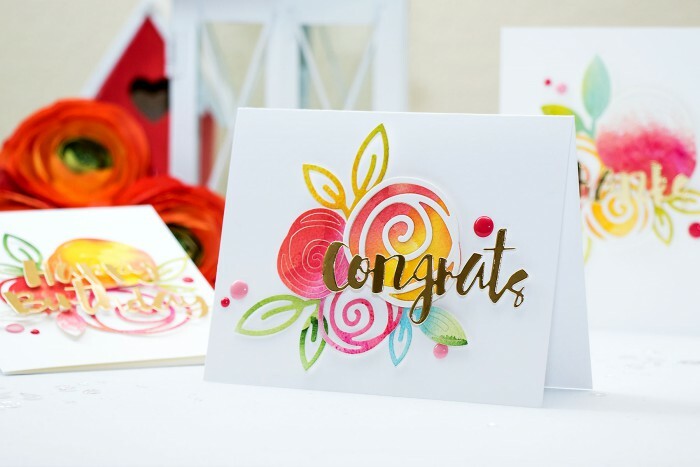 What do you say we do some very easy water-coloring and some fun die cutting? 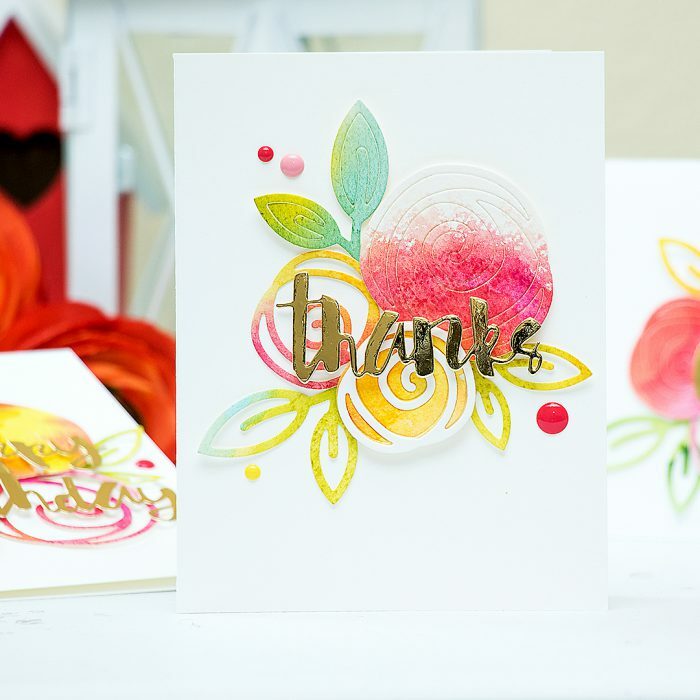 I have a few projects I’d like to share in this blog post that I created using watercolor die cuts. Creating simple and colorful watercolor backgrounds is something I LOVE to do! I am always fascinated by the ways different colors interact together and move on my paper creating beautiful effects. Had I had time – I would be making watercolor backgrounds every day, all day. For this project I used my current favorite Arches Cold Press Watercolor Paper and Gansai Tambi Watercolors. I wet my paper using clear water and a large flat paint brush and added a first layer of colors (yellows, orange, red, green and blue). I let the colors mix and flow on the paper and create beautiful transitions (aside from the red + green which, as expected, resulted in mud). Used my heat tool and dried the paper completely and added more pigment to some areas – more green, more yellow and some pink. I can’t say I was 100% happy with the watercolor background I created, but I knew it would look quite different after it was die cut. 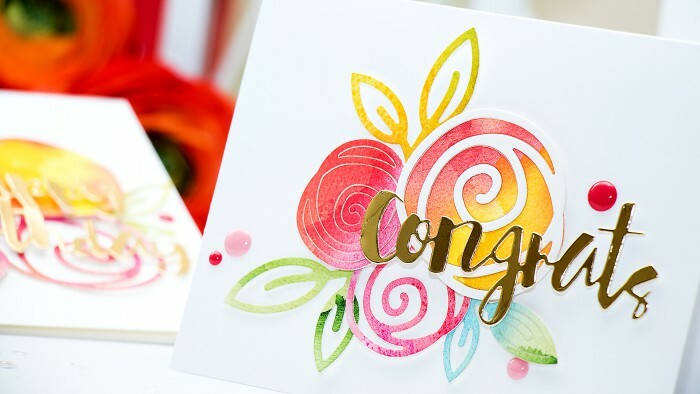 I used Simon’s Single Roses dies and die cut several large and small flowers and leaves out of my watercolor background. I kept the negatives in a few of them just to make them look a bit different. I also die cut flowers out of white cardstock to layer on top of the “solid” roses. For the sentiments I went with a group of beautiful “painted” dies and die cut them out of gold mirror cardstock. I also added a few pink and yellow enamel dots from my stash and that finished my cards. Very beautiful, fresh and juicy cards! Love how you watercolored here. thank you, darling! I’m getting dangerously addicted to watercolor. I have to have these dies! Awesome card!! MERRY CHRISTMAS! Merry Christmas to you too, Vicki! /You make it look so easy! Must get brave and try it.